Since it’s impossible to improve our interactions without inspecting the service quality that our Customer Success Teams are providing to you, ANCILE has recently implemented a new customer satisfaction process that gets automatically initiated 24 hours after an issue is solved. You will receive an email asking you to answer one simple question. Click the link, choose your rating, enter a comment if you wish, then click Submit my rating. That’s all there is to it! 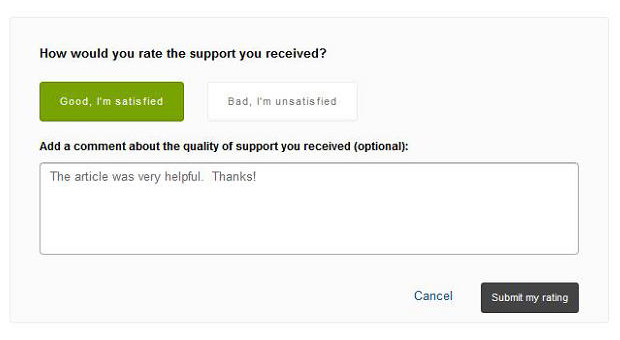 After only a few weeks of deploying the customer satisfaction feedback process, we’ve been delighted by the high response rate and the many positive and constructive comments and feedback that many customers have provided. So the next time we close an issue for you, we encourage you to take a few minutes to let us know how we’re doing. We promise to read each comment and we will receive your feedback with openness and an ongoing commitment to improve. Reminder: Crowd Sourced Authoring and Tasks Webinar Tomorrow!